While this year some pieces isolated participants through technology, others relished their theatricality and fed off the physical presence of live performers. The multiple festivals accompanying the annual convention of the Association of Performing Arts Producers present a dizzying number of performances in New York in a matter of days. While this year some pieces isolated participants through technology, others relished their theatricality and fed off the physical presence of live performers. 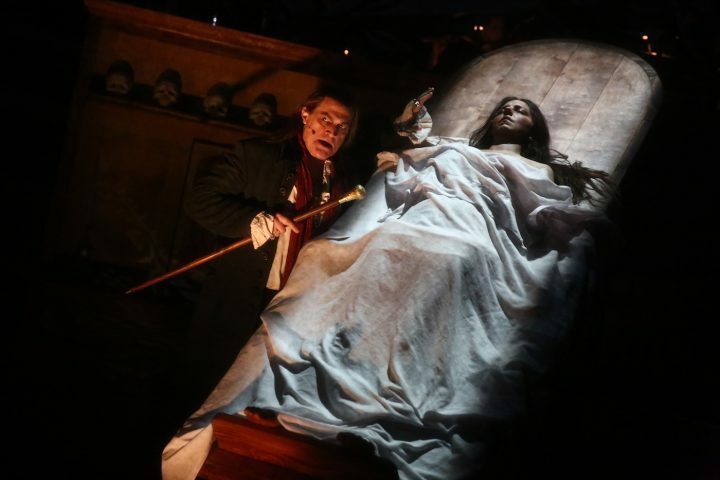 David Lang and Mark Dion’s opera Anatomy Theater at BRIC (Prototype Festival) revels in Grand Guignol gruesomeness: it enacts an 18th-century anatomy lesson through the public dissection of the body of a young woman (Peabody Southwell). In the opening song she confesses to killing her husband and two small children before she is hanged. Rest assured, she is a sympathetic character. Following the onstage hanging, Southwell is virtually naked throughout, strapped to an upright contraption so that the dismemberment of her body is in plain view. Robert Osborne, superbly cast as the pompous Baron Peel, narrates the dissection, as his assistant (Timur) extracts the internal organs from her body and vigorously saws them open, his hands running with blood. This old-style theater fakery was deliciously well executed. The antiquated and long disproven theory of Anatomy Theater, advocated by Baron Peel, is that bad character is manifested in the physical body through illness or measurable physical details, as in the pseudoscientific racist ideologies, such as eugenics, perpetuated by the Nazis and now American white nationalists. In a touching refutation, Timur tenderly renders the most appealing song, “Clearly / Some Very Strange Light,” remarking on each spotless organ excised from a woman driven to crime and madness by a lifetime of sexual and physical abuse. The lively presence of the performers in artist Edo Nugroho and theater company Waang Bocor’s God Bliss (In the Name of Semelah) at the Asia Society as part of the Under the Radar festival, was the central pleasure of the piece. Five men portrayed countless characters and performed all the dances and songs as well as the shadow puppetry. 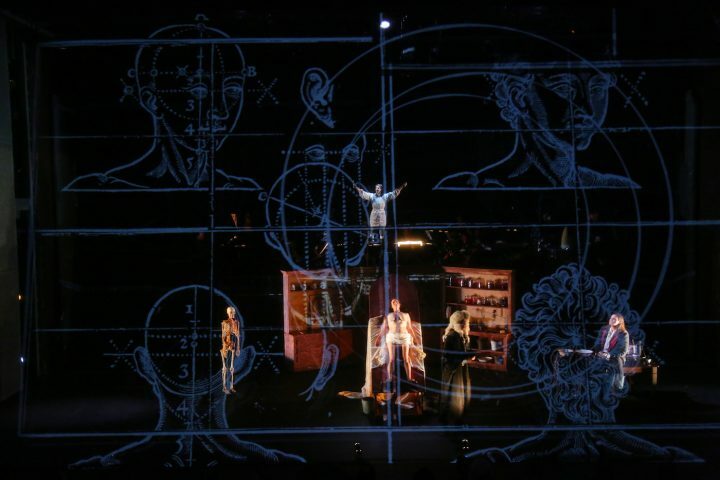 In the middle of the stage, inside a heavily decorated painted arch, stood the projection screen for the puppetry; to either side were similarly decorated mini-sets whose translucent curtains were also used for projections in a long chase scene. The Asia Society’s programming director explained the disjunctive styles and narrative strands prior to the show, and the printed program included some notes about the apparently numerous and dense allusions to the history and mythology of Islam in Indonesia. The elusive story elements tended to fade incomprehensibly into the background, as did the supertitles, which were dimly visible behind the puppetry screen. The projected translation did not permit one to follow the dialogue closely: a couple of lines of text purported to represent extended colloquies, and there were many unexplained expressions and references. What did, however, ceaselessly communicate itself was the joy that the performers took in their work. The low flat stage at the Asia Society allowed their infectious fun to flow down and into the audience. Trajal Harrell brought his signature piece, Twenty Looks Or Paris Is Burning at the Judson Church, the (S) or “Small” edition, to the Abrons Arts Center as part of the American Realness Festival. Harrell presented (S) at the New Museum in 2009 and has developed several related works in different “sizes” under the umbrella title of Twenty Looks, imaginatively dealing with the Judson Church dance revolution downtown in the 1960s and the separate uptown eruption of voguing. In the large auditorium at Abrons, Harrell placed the audience on the stage with him for the performance. The seating seemed to imitate a fashion show in a tent, with rows of viewers sitting close to the action along the length of a walkway. In (S), Harrell transforms himself with different “looks,” costuming as drag or role-playing, performing a wild hopscotch through the fields of gender, race, geography, high and low culture, and class. He changes in full view of the audience, indeed within inches of the front row, before strutting out on the runway or dancing across the stage. He uses a common spiral notebook with handwritten numbers as a signboard, draping it across the back of a folding chair, and flipping the pages to help the audience follow along with the numbered looks in the program. His quivering presence animates the performance throughout, which includes tongue-in-cheek elements, as when he turns on a fan in plain sight and allows it to inflate his superhero cape while flying, feet on the ground. The choreographer/dancer Meg Stuart uses her body as the reference point in developing her work, as she explained onstage in her show An Evening of Solo Works, also part of American Realness. In the half-dozen pieces she performed, many relied upon tightly contained movements, often poses. Alternatively, she seized and stretched her flesh, seemingly painfully, and made her own hands appear to be foreign beings attacking her body. 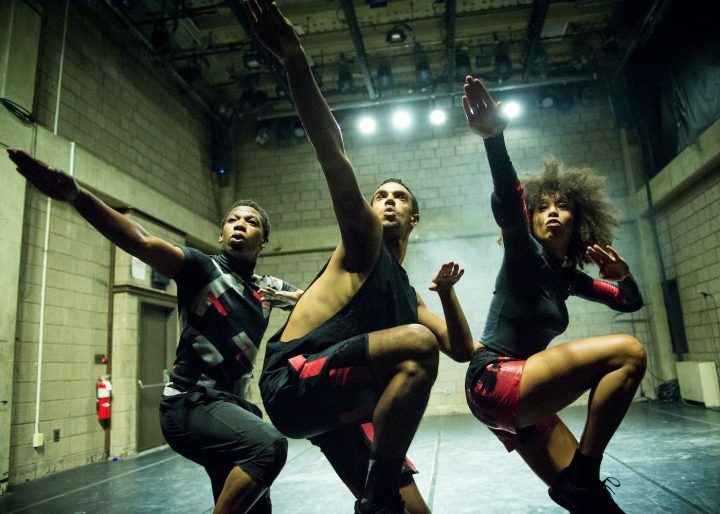 Ligia Lewis, another American Realness participant, choreographed and performed in the U.S. premier of minor matter. Lewis and her buoyant dancers, Jonathan Gonzalez and Hector Thami Manekehla, athletically asserted the innate power of their bodies, especially when conjoined in improbable configurations, held for moments, before they again ran, spun, lifted each other up to climb the wall, chanted, and rolled, with relentless intensity. The intimacy of the Experimental Theater at the Abrons made the experience palpably fleshly. These artists gave generously and truthfully through their presence, a valuable touchstone in these strange times.